Here in “Notable Numbers,” we attempt to unearth a plethora of interesting stats and fantasy-relevant facts each week. Today, among other topics, we highlight D'Angelo Russell’s rise and the disappointing play of both Victor Oladipo and DeMar DeRozan. 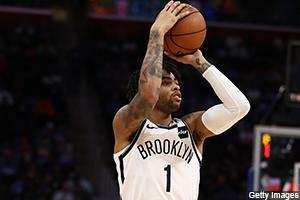 2018-19 was viewed by many in Brooklyn as a make-or-break year for point guard D'Angelo Russell. He was coming off a relatively disappointing debut season with the Nets, as his scoring average decreased and he posted a career-high in turnovers despite playing a career-low 25.7 minutes per game. As a pending restricted free agent, there was some debate as to whether or not Brooklyn would be wise to commit major money to an extremely talented but inconsistent player. Well, based on his play of late, Russell’s asking price is rising by the day. Dating back to January 7th, the Nets are 17-5, which is the second-best record in the NBA over that stretch. Over that 21-game stretch, Russell is averaging 20.7 points and 7.3 assists. Since the calendar flipped to January, Russell has taken his production to an even higher level. Brooklyn is 8-2 in 2019. In those eight wins, D-Russ is averaging 26.4 points, 7.6 assists (vs. just 2.1 turnovers), 4.5 made 3-pointers and 1.1 steals, while shooting 50.3 percent from the floor, 45.6 percent from downtown, and 91.7 percent from the free-throw line. He’s scored a combined 71 points and knocked down 15 treys in the Nets past two games. Per Basketball-Reference, Russell is the first player in Nets franchise history with at least 30 points and seven 3-pointers in consecutive games. The most impressive aspect of Russell resurgence has been his combination of trifectas, dimes and limited turnovers. In 2019, D’Angelo is the only player in the NBA averaging more than seven assists and three 3-pointers, but fewer than three turnovers per game. Sum it all up, and Russell is posting top-50 value in nine-category formats this season. Over the last month, he’s soared all the way to 17th overall. I thought Brook Lopez was criminally undervalued on draft day last October, as he had an ADP of around 95 in most fantasy drafts. Due to sort of lost season in Los Angeles, I fully expected to him to bounce back in a major way in Milwaukee. While his point total hasn’t been as high as I would have suspected, he’s scoring in all the right ways for fantasy owners, as he’s knocking down a career-high 2.5 triples per game. Better yet, Brook has been a beast around the rim, swatting a career-high tying 2.1 shots a night. Lopez has been especially aggressive on defense recently. He’s blocked at least three shots in six of Milwaukee’s last eight games and is averaging 3.5 rejections per contest over that eight-game stretch. This rare ability to stretch the floor on one end and protect the paint has Lopez on pace to accomplish a feat that the league hasn’t yet seen. Per Basketball-Reference, he is on pace to become the first player in NBA history to average more than two blocks and more than two made 3-pointers per game over the course of a full season. Factor in the solid percentages, including over 80 percent from the free-throw stripe, and it’s easy to see why Lopez has vastly outproduced his ADP and is returning fourth-round value. Victor Oladipo blossomed as a fantasy superstar last season. He posted career-highs across the board in 2017-18, won the NBA's Most Improved Player Award, and finished the year in the top-ten in nine-cat formats. He started out the 2018-19 campaign in similarly impressive fashion, averaging 23.8 points (on 45 percent shooting), 7.1 boards, 4.9 dimes, 2.6 triples, 1.8 steals and 0.5 blocks over the first month (14 games). He scored at least 20 points in 13 straight games. However, we learned in mid-November that 'Dipo was dealing with soreness in his right knee. He played through it for a couple of nights but was eventually ended up missing 11 consecutive contests. Since returning, he hasn’t been the same player. Over his last 21 games, Oladipo is shooting below 40 percent from the field and has scored more than 20 points in consecutive contests just once. Unfortunately, things are headed in the wrong direction and have gotten progressively worse. Over the Pacers last eight games, Oladipo is averaging 15.6 points, 3.6 rebounds, 4.9 assists, 1.8 triples, 1.4 steals and zero blocks, while shooting just 38.0 percent from the floor and 70.4 percent from the charity stripe. In nine-category leagues, Oladipo shockingly ranks 190th overall during this eight-game stretch. If it were just a shooting slump, I’d be more willing to look past this recent dive in production. However, his stats are down across the board. Rebounds, steals, swats, etc. ‘Dipo has one blocked shot in his last 15 games, or 491 minutes of court time. One! It’s clear his explosiveness has not yet returned. Thus, while Oladipo seems like a prime buy-low target, being somewhat apprehensive maybe the best course of action. I think it all depends on what you’d have to give up in order to acquire him. I discussed Oladipo and others in a podcast with Matt Stroup. Another player that has been frustrating fantasy owners of late is Spurs guard DeMar DeRozan. After an offseason trade sent him from Toronto to San Antonio, DeRozan made an incredibly impressive first impression with his new club. Over the first ten games of the season, he averaged 26.4 points, 6.4 boards and 6.8 assists, while shooting over 50 percent from the floor and 90 percent from the stripe. Although his numbers dipped a bit in the weeks and months that followed, he was still posting solid stats on a consistent basis. However, his production has nosedived recently. After missing last Friday’s victory over the Timberwolves, DeMar returned to action on Sunday but scored just eight points on 4-of-16 shooting. He’s scored fewer than 20 points in each of the Spurs last six contests, and, over this six-game stretch, he is averaging 13.2 points, 5.8 rebounds and 6.0 assists, while shooting a putrid 35.0 percent from the floor and 52.9 percent from the stripe. Dating back to New Year’s Eve (a ten-game sample size), he is scoring 15.1 points a night and converting only 38.4 percent of his field goal attempts. Because of his lack of 3-point prowess (DeRozan has made a grand total of one 3-pointer since Thanksgiving), his fantasy value is overly reliant on scoring efficacy. When his points and percentages plummet, it can be crippling. Over his last ten games, DeRozan ranks 217th overall in nine-category leagues. The Warriors blowout victory over the Lakers on Monday was the 500th career game for Draymond Green. Although his scoring and field goal percentages have decreased a bit in 2018-19, he is still averaging over seven rebounds and seven assists per game for the fourth straight season. Since Green first replaced David Lee in Golden State’s starting lineup back in 2014, Draymond has been one of the NBA’s most versatile and well-rounded players. As a result, he’s been a valuable fantasy contributor despite attempting fewer than eight shots a night. Just how unique is Draymond’s production? Consider this: Per Basketball-Reference, Green is one of only six players in NBA history to tally at least 4,000 points, 3,000 rebounds, 2,000 assists and 500 blocks over his first 500 career games. The other five players in this unique club are Michael Jordan, Lamar Odom, Chris Webber, Tracy McGrady and Kevin Garnett. Green has also knocked down 458 3-pointers. Of those five players listed, T-Mac is the only one with more treys than Draymond.